I have owned a copy of this book since it released, and I finally got around to reading it. Now I wish I hadn't waited so long. Time and again, the words of Spurgeon from his sermons and the commentary by Alcorn spoke encouragement and excitement and truth into my heart. What a blessing. I will revisit this book in the future. by Randy Alcorn, you can get a taste of Spurgeon’s eloquence, and of Heaven’s majesty. We Shall See God is a collection of Spurgeon’s sermons about Heaven. Randy Alcorn has done a masterful job of culling through the prince’s sermons to pull out excerpts that talk about the beauty of Heaven and the horrors of Hell. Randy’s comments following each passage from Spurgeon are wonderfully presented. He doesn’t “talk over” Spurgeon, nor does he simply rehash what Spurgeon already said. He eloquently amplifies or briefly explains. This book is designed to be used as a 50-day devotional reading. But I’ll be honest with you: I couldn’t put it down! I was so enthralled by Spurgeon’s description of Heaven, that I couldn’t wait to read more. And now I can’t wait to tell others more about Heaven. Lately there have been so many authors and blogger hypothesizing about Heaven and Hell and the after-life. But Spurgeon doesn’t give us his opinion, he gives us biblical insight. And wouldn’t you much rather hear what the Creator of Heaven has to say about it, than what any mere mortal has to say? I highly recommend this book to you. You will not only look forward to Heaven even more, but you will enjoy your brief journey on this Earth even more too. Spurgeon reached millions with his “timeless pearls of wisdom,” much of it out of print today. Thanks to Randy, millions can again be influenced by this passionate and powerful “prince of preachers” through these remarkable devotions. Never before in our nation’s history have we needed more profound spiritual insights than we do today in America’s season of political correctness. Randy Alcorn has outdone himself with this compilation. Not only is this an excellent devotional, it’s an excellent Bible study resource or meaningful gift for friends and loved ones. I'm not generally a fan of daily devotionals. The readings tend to be like bite-size shortbread biscuits—a verse or two of Scripture appended to a paragraph with a corny anecdote. My appetite runs more to things like rare steak, 9 ounces or more. So when I'm reading devotionally (devoting time to God, and listening to Him), my preference is to read straight Scripture, at least a chapter or two at a time, without prefabricated what-do-you-think-about this-style questions, thoughts-of-the-day, fortune-cookie quotes, cutsie human-interest stories, or any of the other standard daily-devotional gimmicks. Don't get me wrong: I have nothing against commentaries and study tools, and I use them profusely when I'm studying a text I intend to write or preach on. But when I'm doing purely devotional reading, I prefer to devote all my time and attention to the text itself, so I can hear God's Word without interruption and meditate on it. 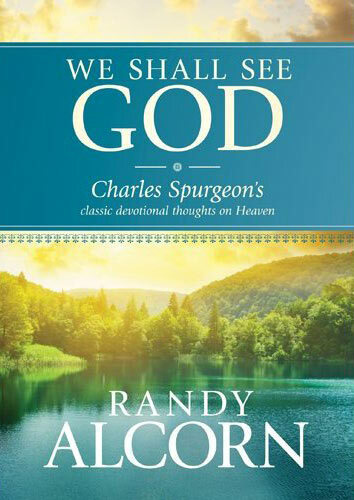 Nevertheless, I very much like We Shall See God, a new devotional book on heaven and the afterlife by Randy Alcorn, with copious quotes from C. H. Spurgeon. It is meaty, rich with insight, engrossing, and fresh (even though the Spurgeon excerpts are more than a century old). As a matter of fact, for my money, it's an even better book about heaven than Alcorn's original bestselling book on the subject. You may very well want to use this book as a daily devotional, and it is plenty nutritious enough for that. Spurgeon's premillennialism comes through wonderfully where he discusses eschatology. Spurgeon's portrayal of heaven is superbly biblical and devoid of speculation. There are also chapters on the reality of God's wrath and the horrors of hell, so this is no syrupy book that might give artificial comfort or false hope to the lost. I think it is a fine book expounding on what the Bible says about the afterlife, and even if you don't use it as a devotional guide, you will find it a good read. It's going in the doctrinal section of my library, not on that top, out-of-reach shelf where I store most of my devotional books.